avial recipe | aviyal recipe | how to make udupi style aviyal recipe with detailed photo and video recipe. 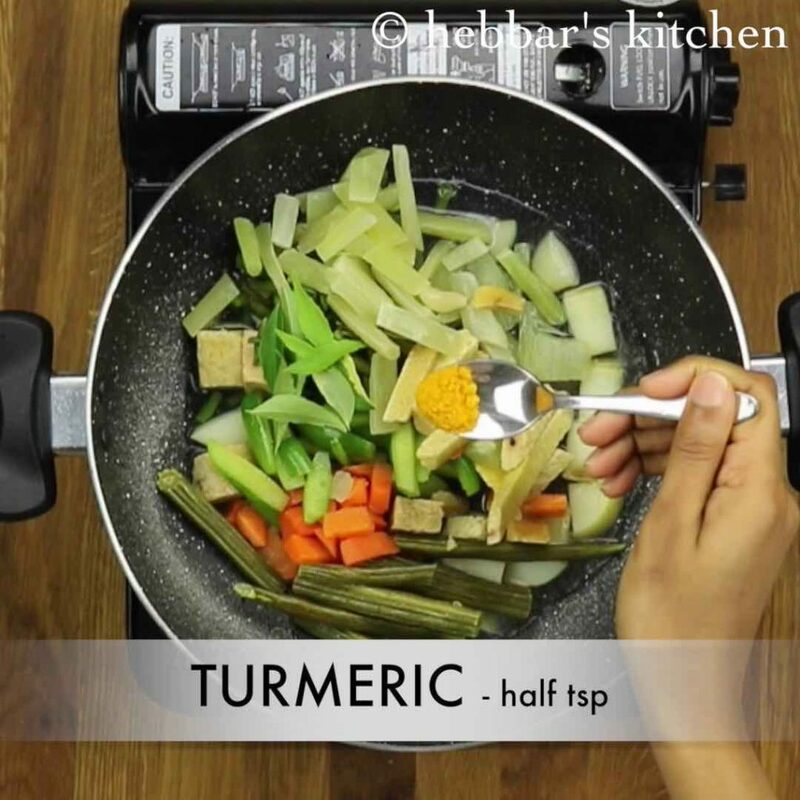 a thick coconut based mixed vegetable curry which is prepared on special occasions. it is predominantly prepared in south india, especially in kerala, tamil and udupi cuisine. avial recipe | aviyal recipe | how to make udupi style aviyal recipe with step by step photo and video recipe. 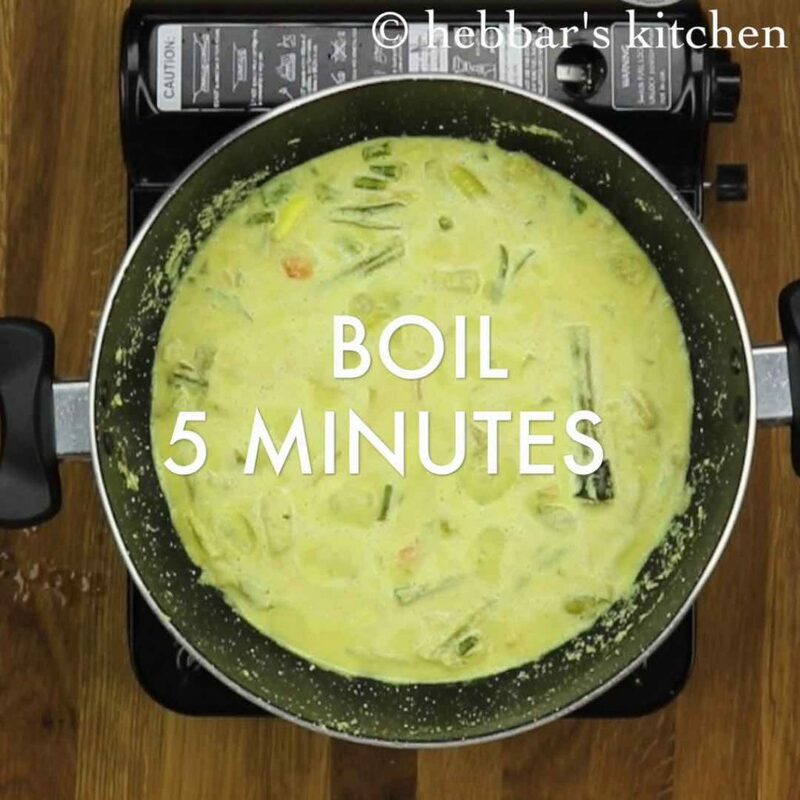 basically a coconut based curry which is typically served with boiled rice or plain steam rice. 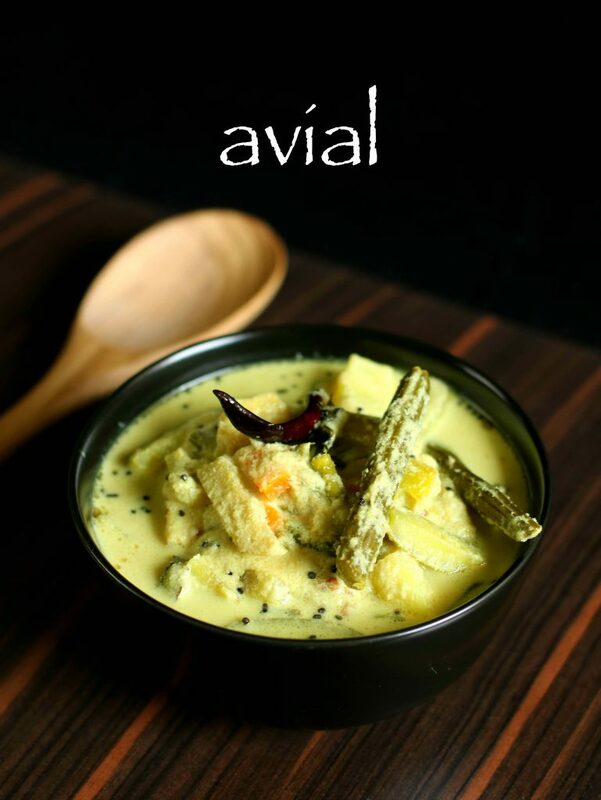 avial recipe is prepared during auspicious occasions and is a must delicacy during ‘sadya’, a vegetarian feast of kerala. there are several stories related to avial recipe. 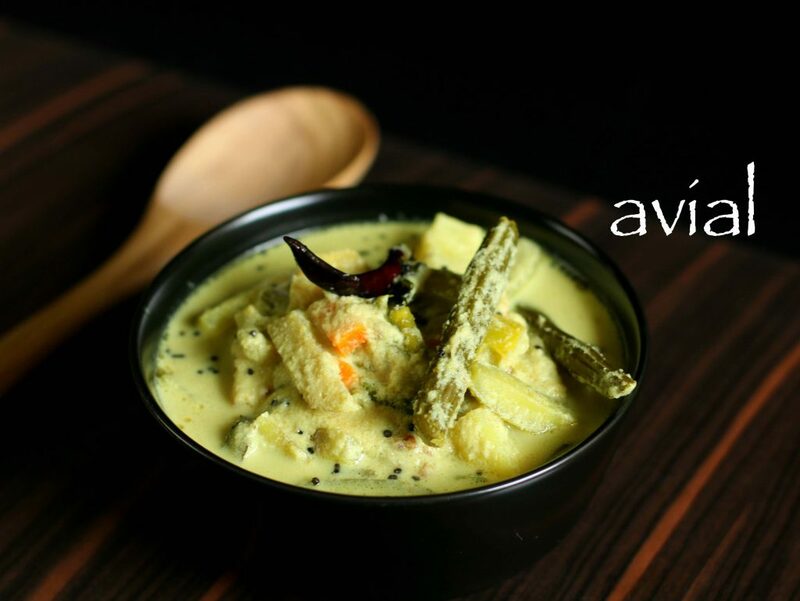 it is believed that, avial recipe was developed by ‘bhima’ during his exile with his other pandava brothers. according to wiki, bhima invented this recipe when he had to serve to king virata and there were no sufficient vegetables for single curry. hence me mixed all the vegetables and added grated coconut to prepare this subtle yet tasty curry. furthermore, some important tips and suggestion for this south indian delicacy. 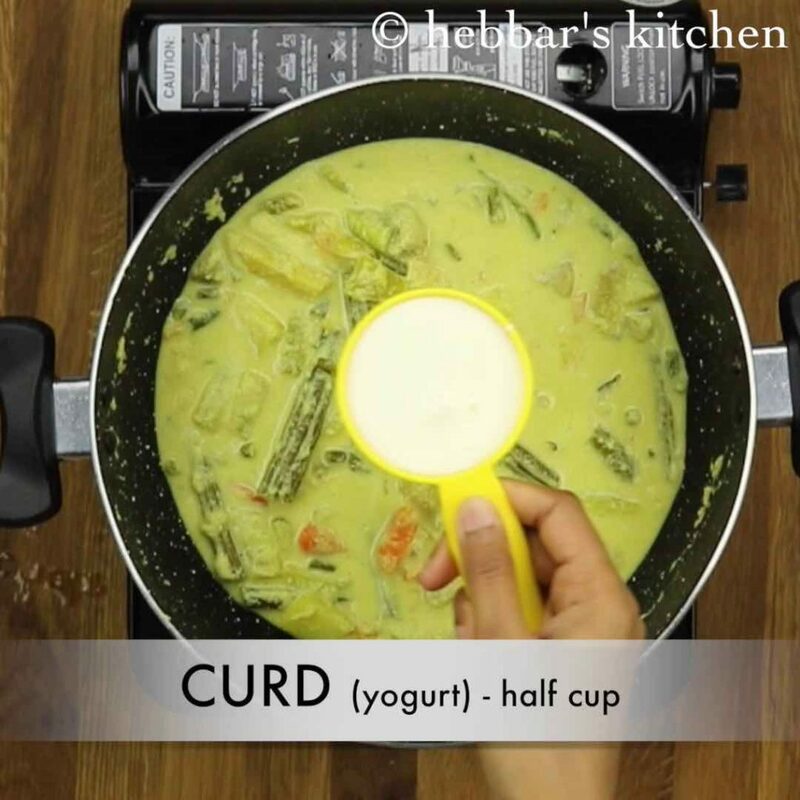 firstly, i have added curd in this recipe which adds the sour taste to the curry. optionally, raw mango or even soaked tamarind water can also be added. secondly, if you prefer to have very thick avial gravay, add 1-2 tsp of soaked channa dal / soaked rice while grounding coconut. beans, potatoes and carrots are the latest introduction to the avial recipe and traditionally were not used. you can skip it if you need a authentic recipe of avial. firstly, in a small blender take, coconut, jeera and green chili. also add water and blend to smooth paste. keep aside. in a large kadai cook potatoes with salt and water. 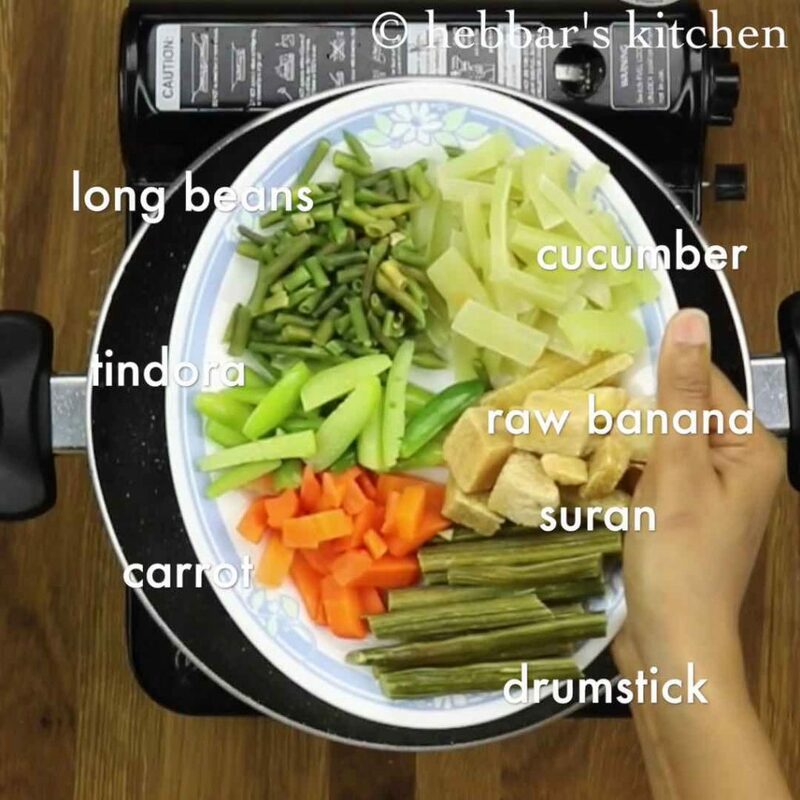 further add mixed vegetables of your choice. add curry leaves, turmeric and mix well. 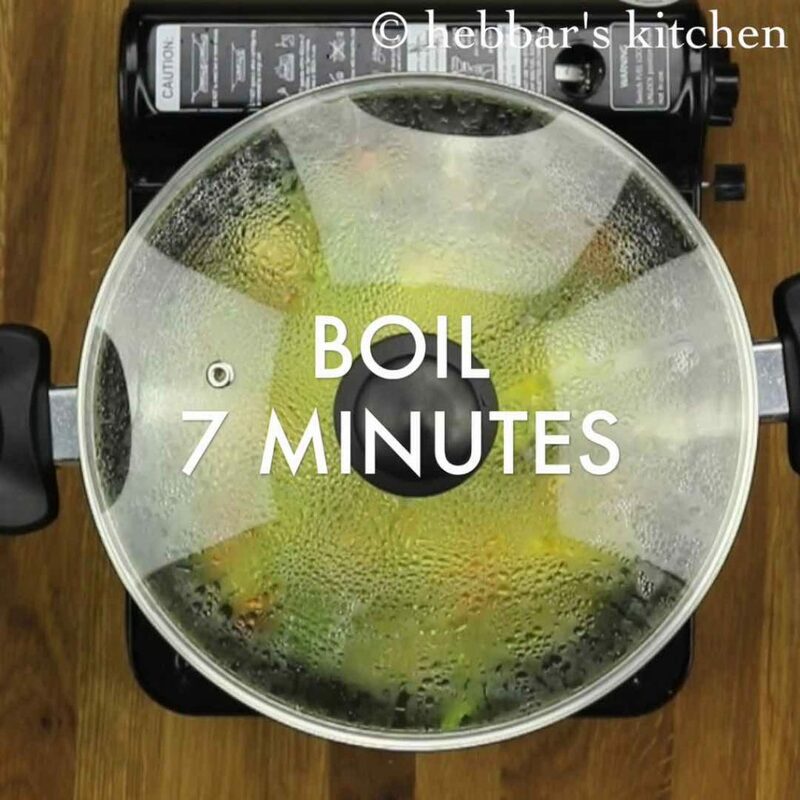 cover and cook the veggies for 7 minutes or till they are cooked well. 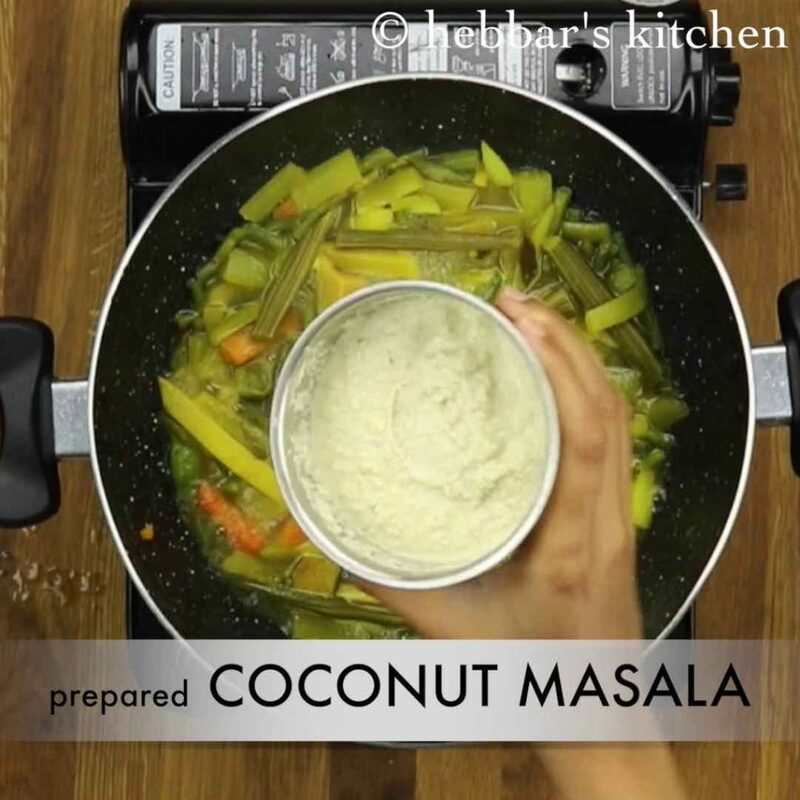 add prepared coconut masala and boil for 5 minutes. turn off the flame and add half cup of sour curd. 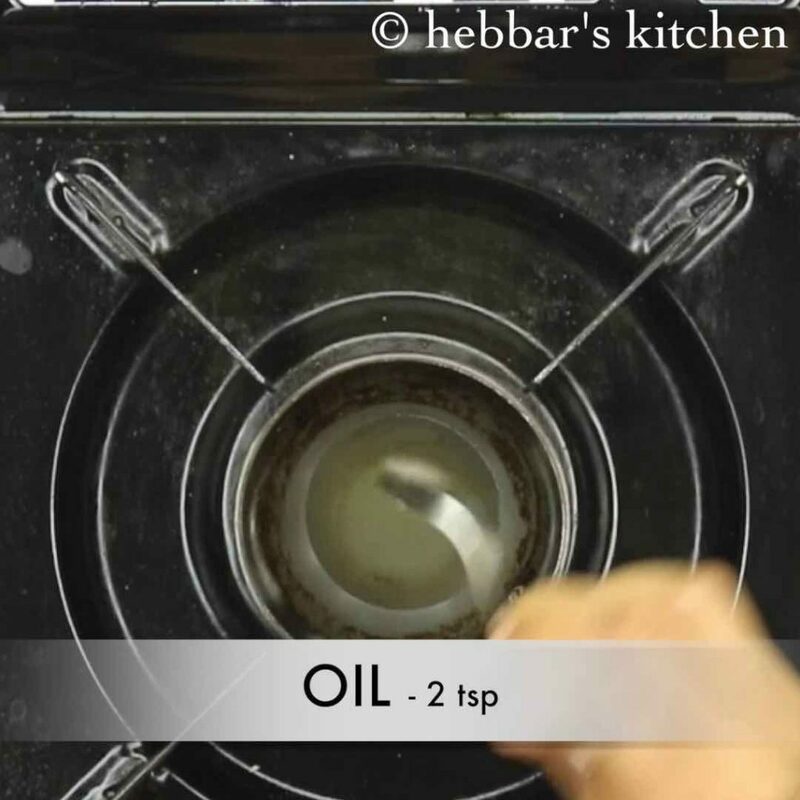 meanwhile, prepare tempering by heating oil. 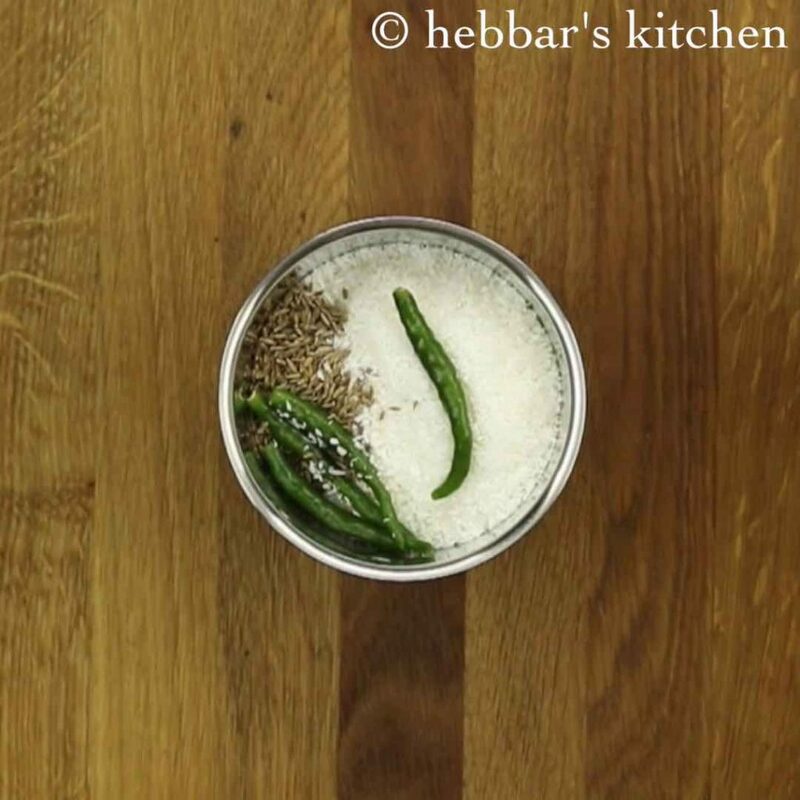 add mustard seeds, urad dal, dried red chilis, curry leaves and asafoetida. 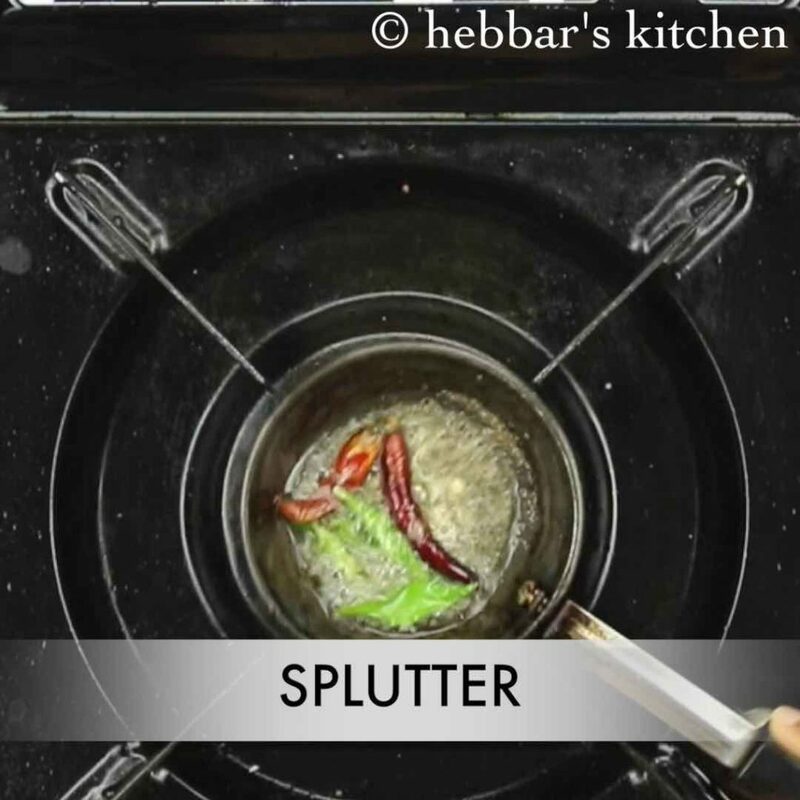 allow to splutter. further, pour the tempering onto the avial and mix well. finally, serve, avial / aviyal along with plain rice or shamige. firstly, in a small blender take, 1 cup coconut, 1 tsp jeera and 4 green chili. 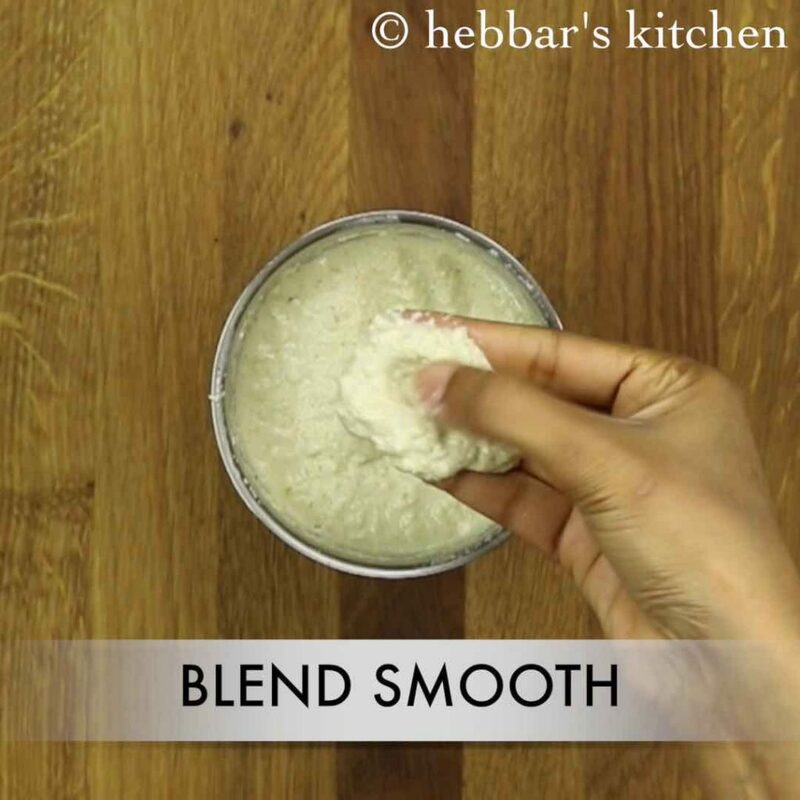 also add water as required and blend to smooth paste. keep aside. 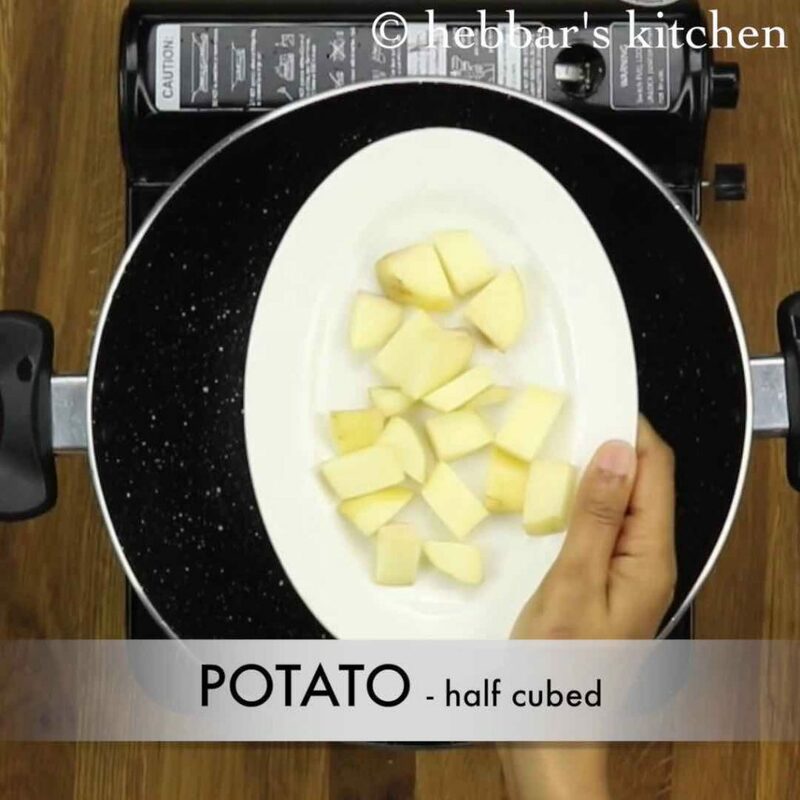 firstly, in a large kadai take cubed potatoes. add 2 cups of water and salt. 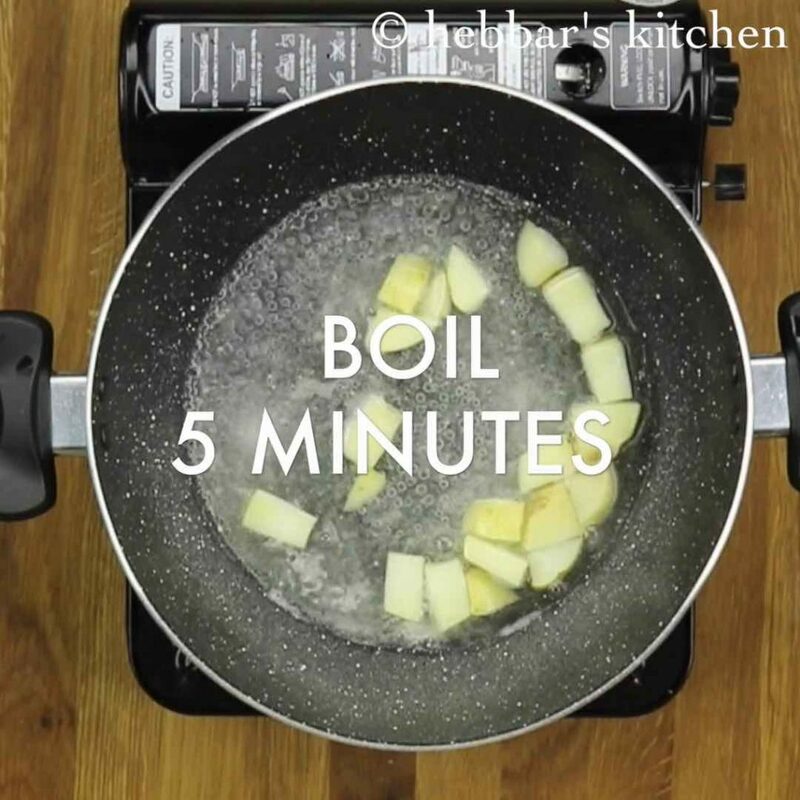 boil for 5 minutes, or till they are almost cooked. further add mixed vegetables of your choice. if you are using mango then skip addition of curd at last stage. add prepared coconut masala and mix well. boil for 5 minutes or till the raw smell of coconut fades away. now add a tsp of coconut oil to enhance the flavour of aviyal. turn off the flame and add half cup of sour curd. switch off the flame, else the curd will curdle. firstly, use variety of vegetables to make aviyal more healthy and tasty. furthermore, to make avial of thick consistency add little water while cooking vegetables, or steam them. 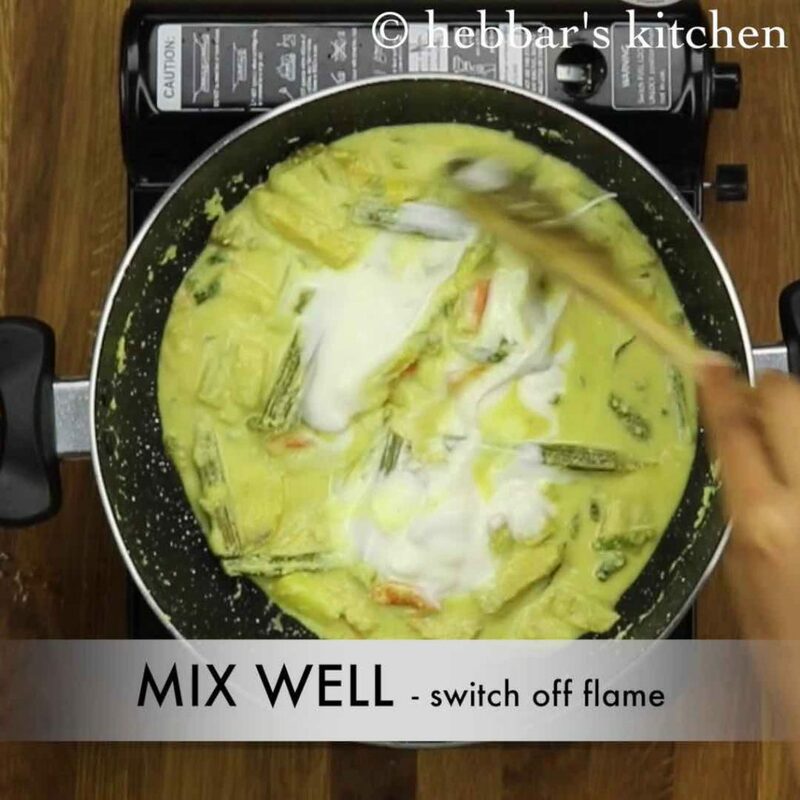 most noteworthy, whisk the curd well and turn off the flame before adding it to avial, as they might curdle. 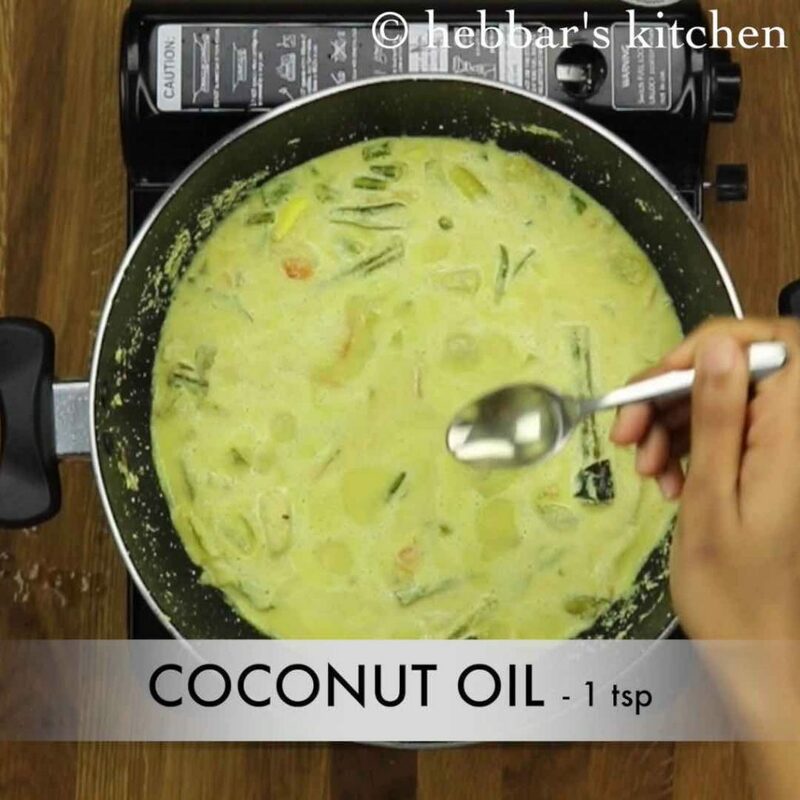 also adding coconut oil will enhance the flavour. if you prefer to have very thick avial gravay, add 1-2 tsp of soaked channa dal / soaked rice while grounding coconut. additionally, skip the addition of curd if you are using raw mango. 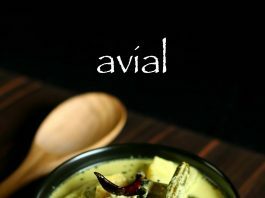 finally, avial / aviyal taste great when it is slightly spicy and creamy. Yes cumin can be excluded but it still tastes delicious! I love aviyal. Your site is one of the best I have ever come across. One small suggestion for Avial you need to grind only coconut and green chillies no need to add jeera. If you add jeera it becomes kootu. 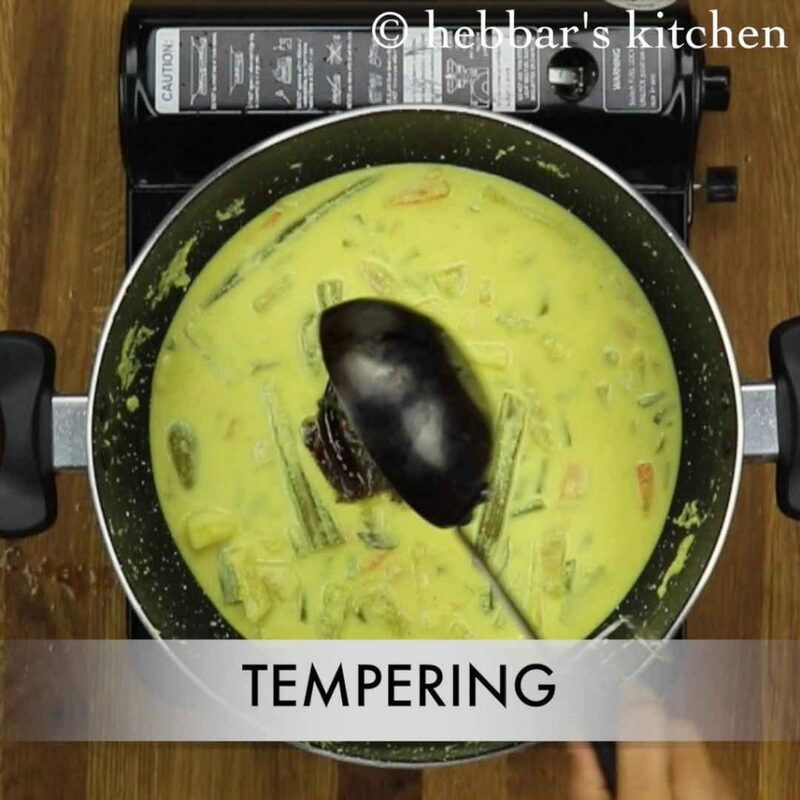 And no need of tempering also. You just have to coconut oil and curd. Your videos and recipes are awesome. I browse only your website for all recipes. It’s very user friendly. But I just want to give one suggestion. In Avial they do not use jeera for grinding. We use only coconut and green chillies. And we don’t temper it with mustard udadh dhal and red chillies. We add paste curd and coconut oil. This is the authentic recipe. Thanks for making it quick n clear with no nonsensical talks. Agree with Radhika, avial does not have any tempering (mustard, etc.). The finishing touch for avial is a few drops of coconut oil after removing from stove. Love your recipes, short and simple. Looking forward to more. Thanks a lot Radhika for this valuable suggestion. I will make a note of it. I’ve been a follower of your blog since it’s been and I must say you have come a really long way. most of your receipes have been a hit in my family. kudos to you for inspiring a million people to cook..
thanks a lot for those wonderful comments Sushma. i really appreciate it. Yes. This is what i do at home. Looks same..
Chaitra Naveen here, am aged 25 and I’m married 4yrs ago. I am a follower of ur site. I’m a great foodie and vegetarian. I too love inventions in food at my kitchen lab. While searching for udupi rasam powder, 2months ago, i found ur site. Really yummm.. If im free i keep going through various recipes u have posted and keep re checking with mine..
My friends and my at my in-laws family Never cooks like how i do, they feel we Brahmins donno to cook like how non Veggies do, we donno variants, we donno to come out of hing and ghee..
All r just soooo pulling back statements! Ur recipes will b posted in a website and i usually post my new recipes in my school group where there r freshers in cooking. I have tried sabbakki idly, bread idly, bread dosa, rawa dosa, cooked rice dosa , veg kollapuri . Today i was free to write u some THANKS.